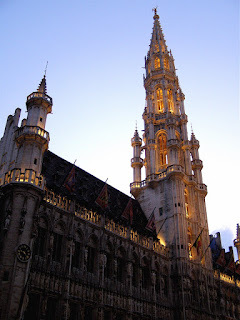 Last weekend, Sean and I went to Brussels. The week prior, we looked up the prices for the train online but went to the train station to purchase the tickets. There we got tickets for less than half what we were quoted online. It was a very nice surprise and we left feeling like we must have somehow gotten away with something. The train (the Deutsche Bahn ICE) to Brussels was very nice. On the German side of the border, it was very fast, maybe 120 mph, and we reached the border in under an hour. On the Belgium side of the border, it was much slower, so in total it took 3 hours door-to-door, including switching trains in Köln. 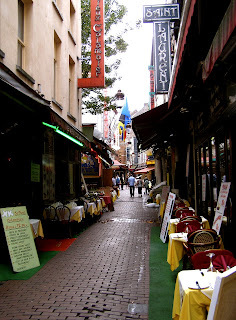 Though there was no stop at the border, the difference between Belgium and Germany was noticeable and not just from the differences in train station signage. Heading northwest from Bonn, the countryside changes from flat farmland to woods with pastures for cows. On the German side of the border, buildings are mostly plaster (over what I presume is brick) painted solid colors: white, gray, a light yellow, sometimes pink, etc. Crossing the border, the buildings feature rustic, exposed red brick. >> Hey, look over there; it's a giant iron crystal thingee. Hmm, well, it looks kinda far and there's beer here. >> I'm sorry, I didn't hear you, I was busy ordering beer. 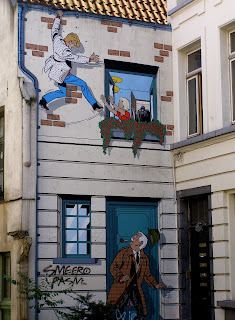 Belgium is where many famous comic book/strip characters were created, such as the Smurfs and Tintin. Many buildings have cartoon murals on their sides. There are also many comics book shops in the city (you know what else there was a lot of? For rent signs. Odd, huh?). We went to the Royal Palace, which is free but only open during the summer. 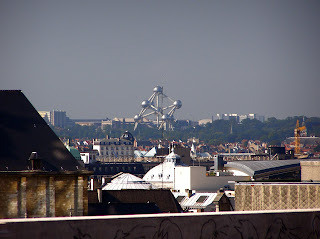 It was a strange mix of royal palace, art exhibit, science demos for kids, and Belgium science press releases. I really can't explain it. 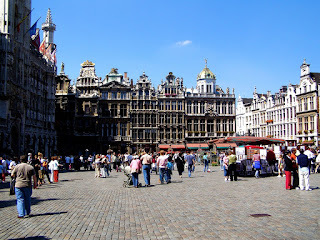 This is one of the most popular tourist attractions in Brussels. It's also really small and unimpressive. 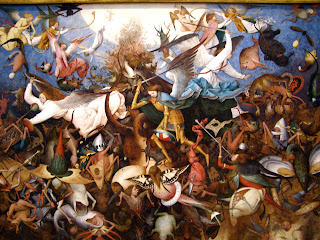 This is Pieter Bruegel the Elder's The Fall of the Rebel Angels. 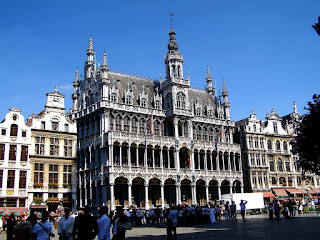 The Grand Place is the old central market square in Brussels. 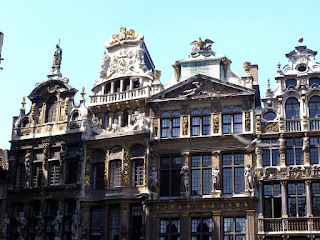 Around the Hotel de Ville (the last two pictures) are the guildhouses, most built around 1700 after the French tried to destroy the Hotel de Ville and got basically everything but. 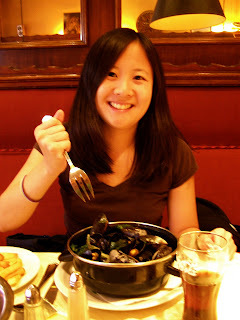 We had mussels every day. While the mussels were great, the frites were severely disappointing. So very sad. The little box of chocolates we bought, however, was excellent. Did you hear? 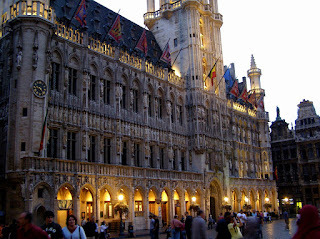 There's a lot of beer in Belgium. Sean worked on the Trappist beers, while I worked on the lambics. We liked this place below so much, we went twice. 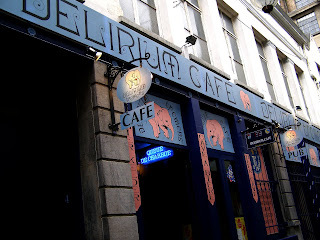 This place had 2000 beers in their beer book. 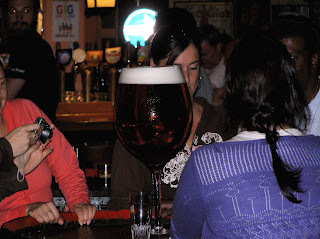 It's at least 5 L of beer. 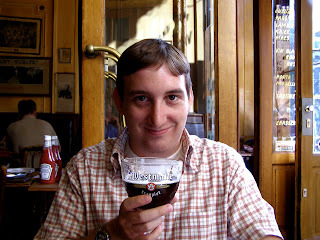 I also tried the Mort Subite Lambic Blanche, Framboise (raspberry), and Kriek (cherry) and the Lindeman Framboise. To round it out, I had some fruit beers (not lambics): apple, cherry, strawberry. I think. 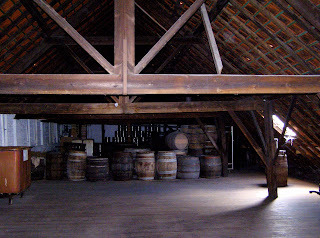 At the Cantillon brewery tour, they explained that the term lambic isn't protected, so any beer to claim to be a lambic, whether they use spontaneously fermentation, mature for several years and use real fruit not sweetners, or not. So which of these other "lambics" are the real deal? 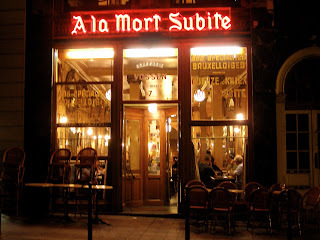 Well, the Mort Subite definitely had the sour flavor, while the Lindeman (while fantastic tasting, like a real raspberry down to the tart/bitter finish) wasn't sour at all. 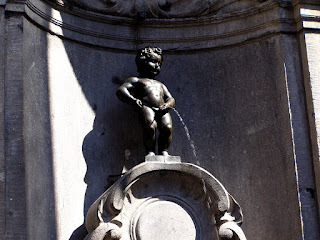 Sean and I both really like the brewery tour; if you find yourself in Brussels, it's totally worth a look. On the ride back, we sat next to the empty operator's cab at the back of the train. It was separated from the cabin by a glass wall which would turn opaque when we approached a station. Weird. Ah Tintin! One of my favourite cartoon characters of all time. Eugene - After everyone in the bar took a picture of it, they sat and thought about how to drink it (not only would it be really hard to lift, you're pretty much guaranteed to spill all over yourself). In the end, they got little glasses and dipped them into the goblet.